Conceptually, grouping nodes allows you to specify a set of nodes that you can treat as though it were “just one node”. Node groups are similar to functions in programming. You can then reuse them inside, which are then called “NodeGroups”, or in other blend-file(s), when appending called “NodeTrees”. To create a node group, in the Node editor, select the nodes you want to include, then press Ctrl-G, Group ‣ Make Group. A node group will have a green title bar. All of the selected nodes will now be contained within the node group. Default naming for the node group is “NodeGroup”, “NodeGroup.001” etc. There is a name field in the node group you can click into to change the name of the group. Change the name of the node group to something meaningful. 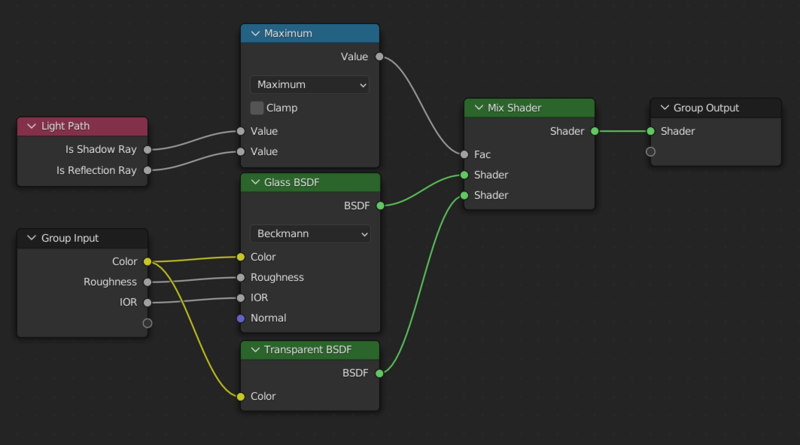 When appending node groups from one blend-file to another, Blender does not make a distinction between material node groups or composite node groups, so it is recommended to use some naming convention that will allow you to easily distinguish between the two types. Once you have appended a Node Tree to your blend-file, you can make use of it in the Node editor by pressing Shift-A, Add ‣ Group, then selecting the appended group. The “control panel” of the Group include the individual controls for the grouped nodes. You can change them by working with the Group node like any other node.